It’s been a couple weeks since my last post. Here’s the bullet points. -Butte Bouldering Bash last weekend. Lots of fun problems with lots of fun people. I managed to do quite a few problems that I’ve been seeing photos of over on montanabouldering.com. The highlight of the day was watching Fruh send a new semi-highball problem near the shoe demo tents. I think it may be a long, long while before that one sees a second ascent. For some reason I didn’t bring my camera so I didn’t get any photos but there’s quite a few here. The Northern Bourbons saw another futuristic ascent next to the Sportiva tent as well. Brandon Smith sent Loren Rausch’s long standing project, naming it the Cockulator. If I had to guess, I would say Loren tried it 14,000 times that day before B came in and showed him how it’s done. On a more serious note, major congrats to Brandon for sending the Bozeman 5.13 testpiece Straw Man in the Gallatin Canyon a few days ago. Nice work B! I went back out to the No. Bourbons this morning to try some lines that I didn’t get a chance to try during the Bash. I was gunning for Lateral Dyno and Special Reserve. I managed to flash Lateral Dyno without much of a warm-up. I think the feet on it have cleaned up a little, producing a good left foot in the perfect spot. It felt more like V3/4 to me. But, it is a dyno, so who knows? Grades aside, it was a really fun problem. Special Reserve put up much more of a fight. Didn’t get it, but I think it will go with a little more effort. -Friday Ho and I made it up to the Cascade Creek boulders below Lava Lake that I “discovered” a few weeks ago. There’s a few faint patches of chalk and a couple lines that have obviously been cleaned (most likely by Brad Carpenter) but I would guess no ones bouldered there in many years. Still tons of FA potential and some good looking second ascents to be had. Not including link-ups, there are about three more lines left. Ho tried two of them a little so you know they won’t go down too easily. There’s another steep boulder just below it that should produce 3 or 4 short problems as well. 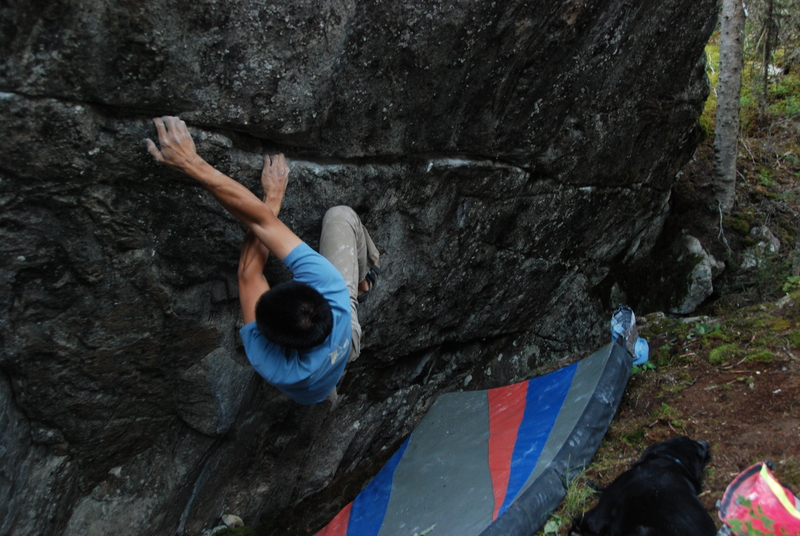 I showed Ho the other boulders higher up that should produce another 20-30 problems, with some killer lines possible. Once the temps cool down in Send-tember we’re going to get a crew and head up to the upper boulders. Let me know if you want in. Looks like it supposed to be great temps tomorrow, then hot, hot, hot for a few days so hopefully everyone can get out tomorrow and send! This entry was posted in Cascade Creek, Northern Bourbons. Bookmark the permalink. Nice to hear the feet cleaned up on LD(and nice send! ), sounds more appealing than the high left on the rail or a bad smear…fun feature for sure. Looks about as good as you were saying, I can go early Saturday morning. Maybe we could leave at 6pm at get an early start. Let me know. Tom – I’ll have to check out the stuff near the road, thanks! There’s still a ton of exploration that needs to be done up there. Let me know if you ever want to head out. dude, the Cockulator is legit! Lets go bouldering soon, I now have weekend days off!